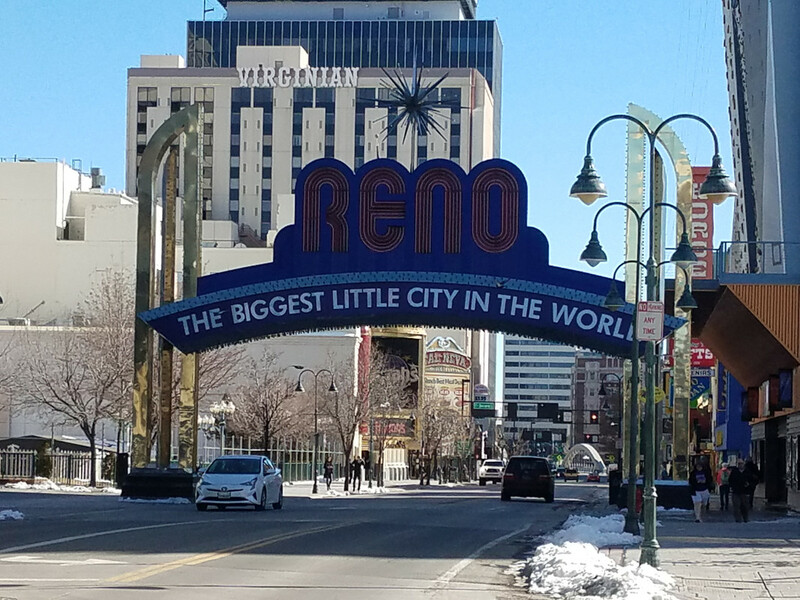 How about a trip report, Reno fans! This was a solo adventure for me. I really do enjoy my annual solo trip as everything is at my pace. And I had some much needed “me time”. My adventure started on Saturday, March 3. 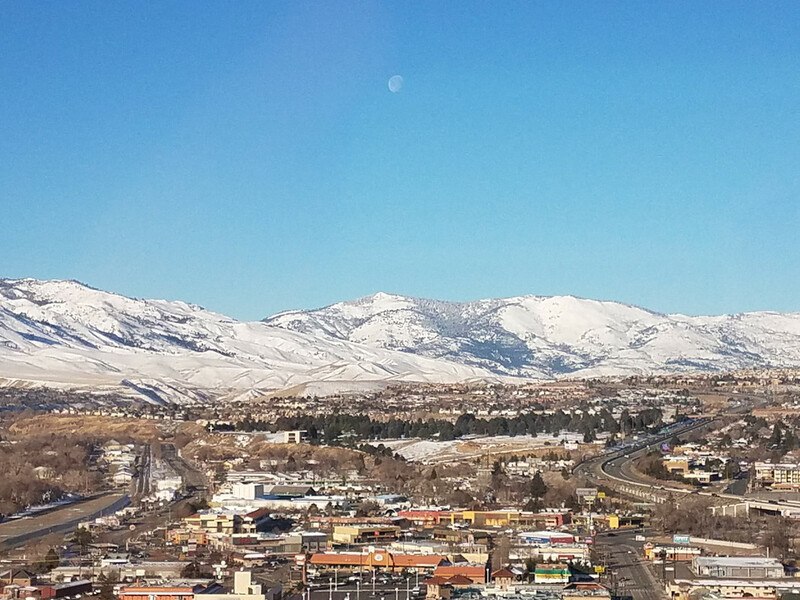 I flew from Seattle to Reno on a morning flight. 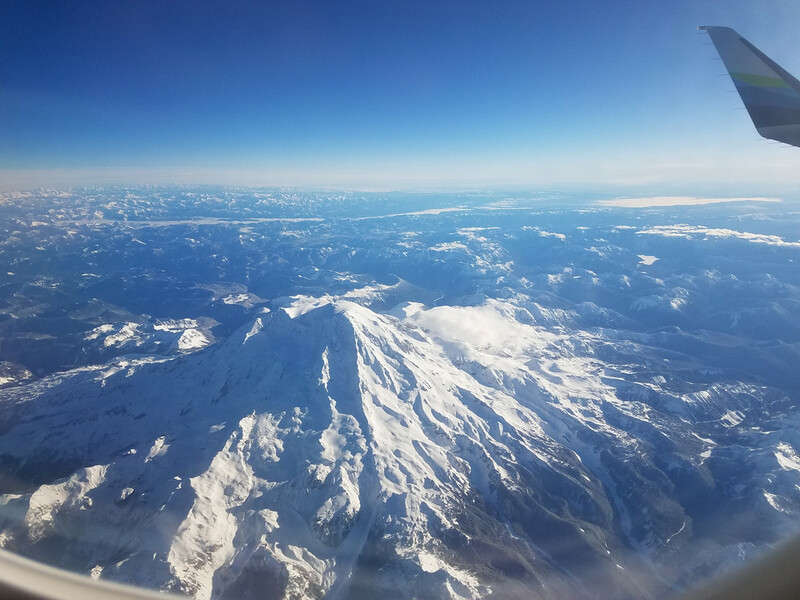 My flight left Seattle around 8:00 a.m. 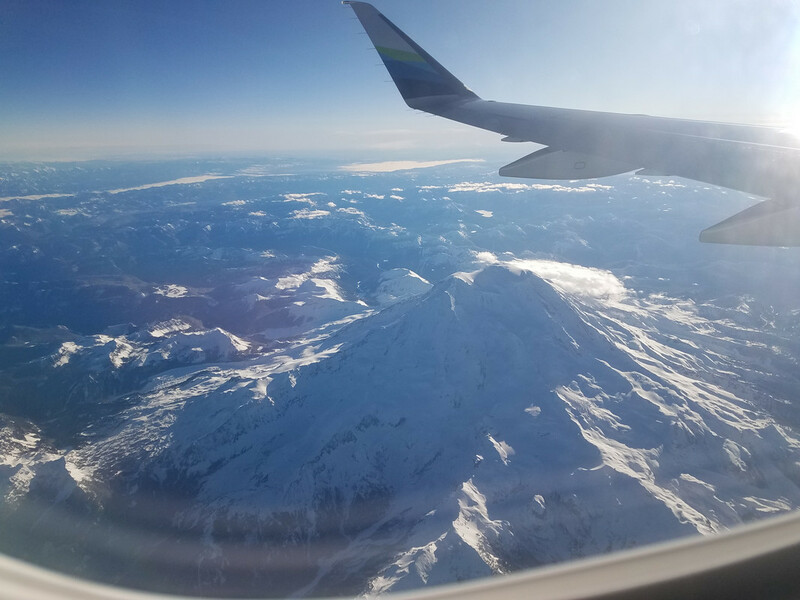 Awesome views of Mount Rainier during the flight! I landed in my beloved Reno before 10:00 a.m. Took the 10:15 shuttle to get checked into my room which was actually ready when I arrived at 10:30 a.m. so it was nice to get checked in right away and so early too. 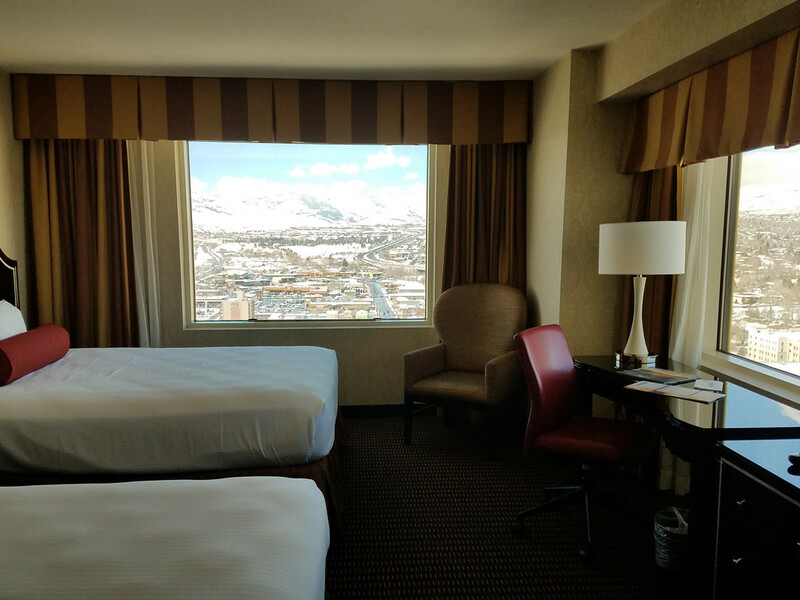 I had 3 nights comped at Silver Legacy and was in a Panoramic category room. I love these end of the hall rooms with 2 windows, each facing a different direction. Lots of light and great views from the room (yes, I do actually spend a little time in the room so am a little fussy about room location)! And no foot traffic and loud people going past your door since you are at the very end of the hallway. A tip if you request this room category: Ask for a 2 queen room instead of a 1 king because the king panoramics are on floors 4-22 and the 2 queen panoramics are on floors 21-32. So you will always be guaranteed a higher floor that way. I like that too because street noise is less noticeable the higher up you are and of course the views are much better! 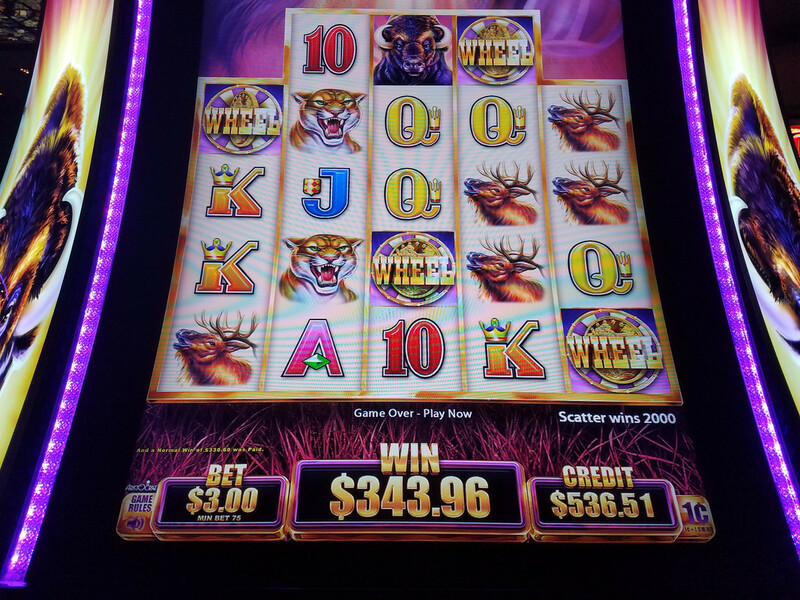 In addition to my comped room I also had $30 in free play and $30 in reward dollars. 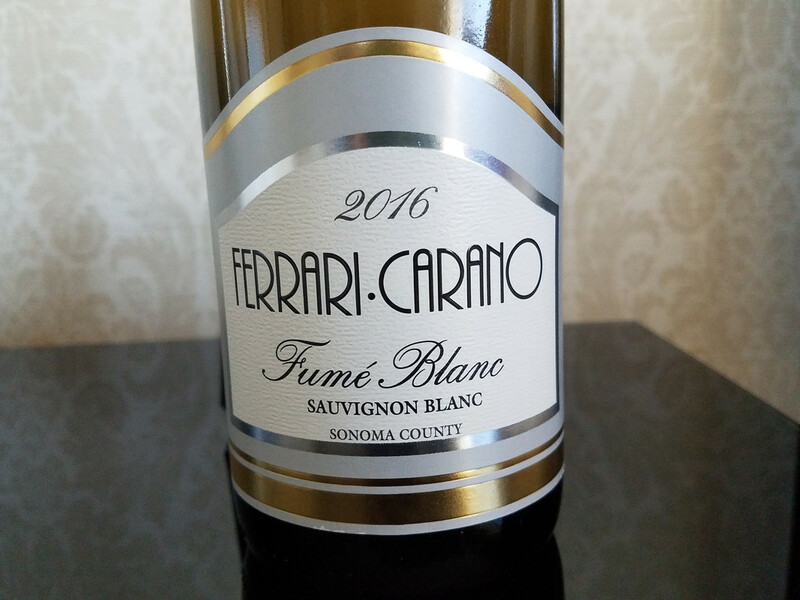 I used the reward dollars in the gift shop and spent part of it on my traditional bottle of Fume Blanc that I like having in the room! 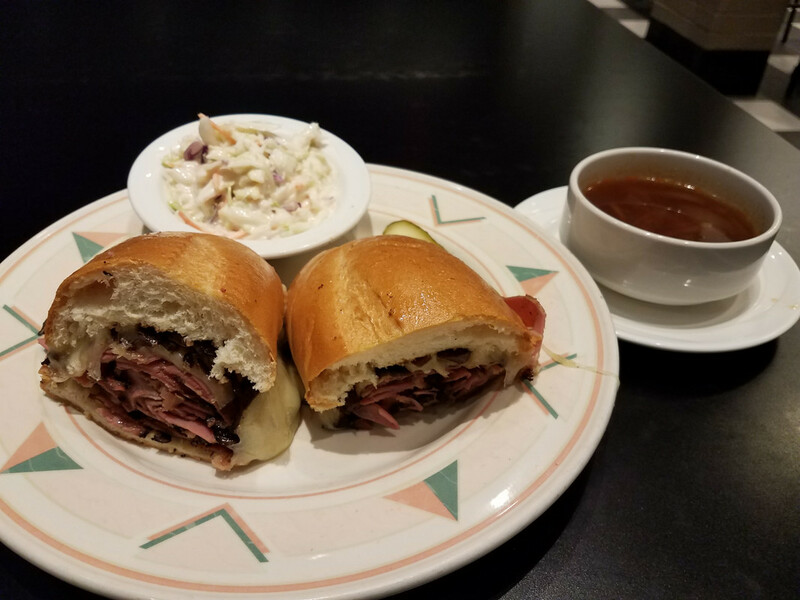 I had lunch at Canter’s Deli at SL. The pastrami dip was very good! 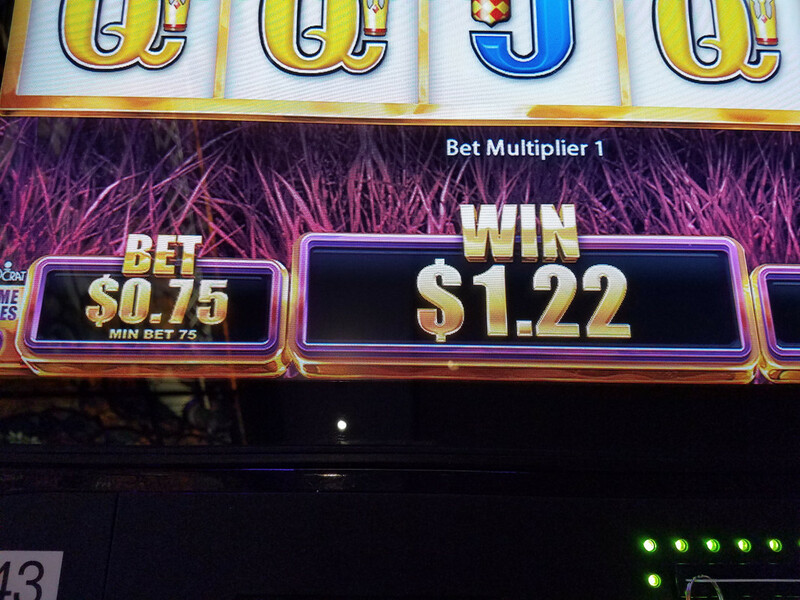 These 3 photos sum up my "luck" of winning on Saturday. 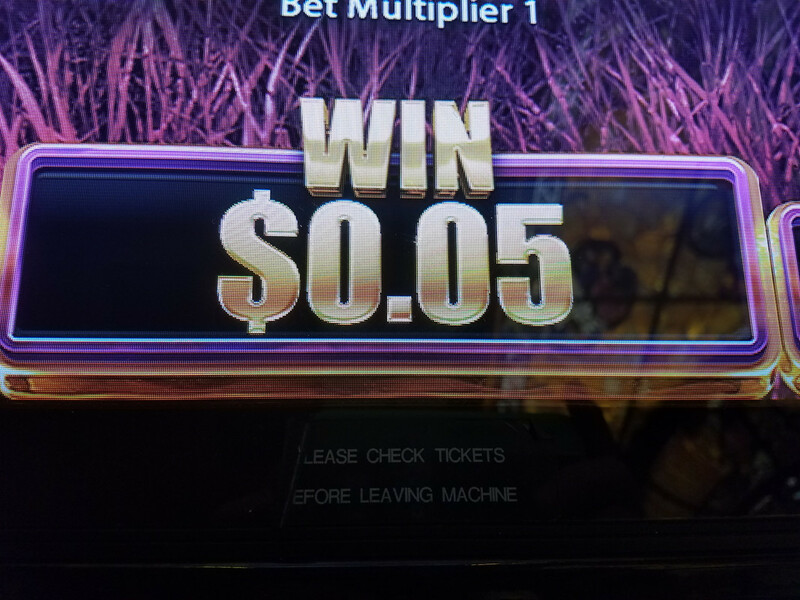 I couldn’t hit anything on the slot machines and lost a bundle the first day. Definitely not a good way to start the trip. 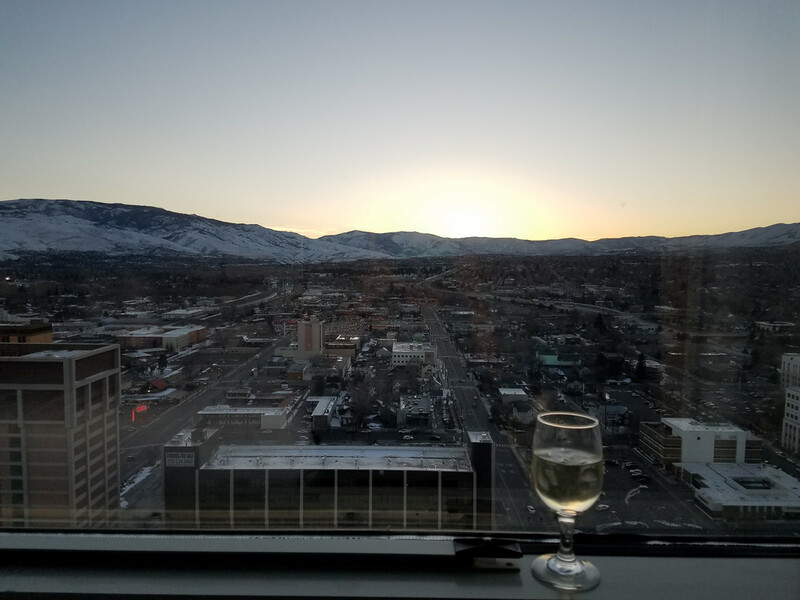 I enjoyed a beautiful sunset from the room on Saturday night with a glass of Fume Blanc. I also had a comped ticket to the “I Mom So Hard” comedy duo show on Saturday night which I had zero interest in seeing so I skipped that show. I had dinner at Hidden Pizza at Eldorado. I had to have dinner here on Saturday night as it’s closed on Sundays and Mondays so this was going to be my only chance to eat here during my trip. They have really great pizza! Two large slices of pepperoni pizza helped to soak up the too many glasses of wine I consumed on Saturday. Sunday morning I had the brunch at Flavors Buffet at SL. 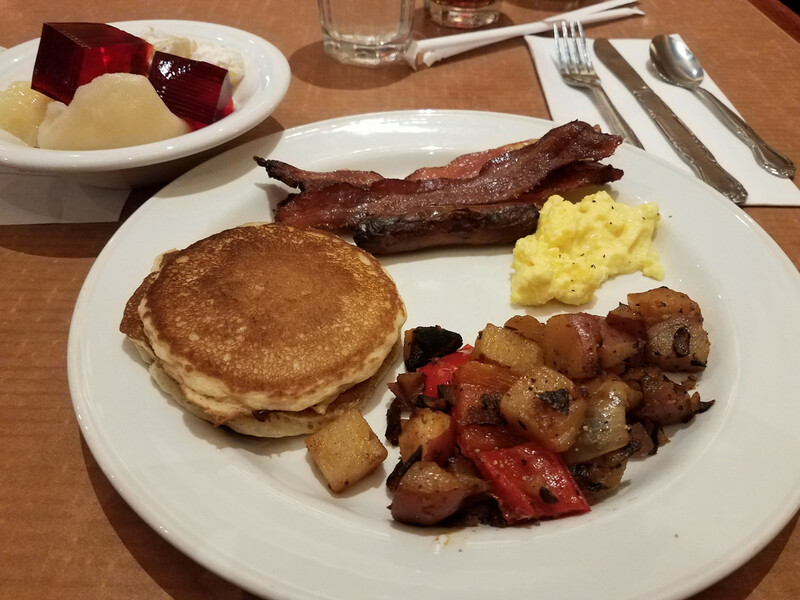 This was going to be my only day to have brunch here during my trip as this time of year they are closed Monday through Thursday and only open Friday through Sunday. 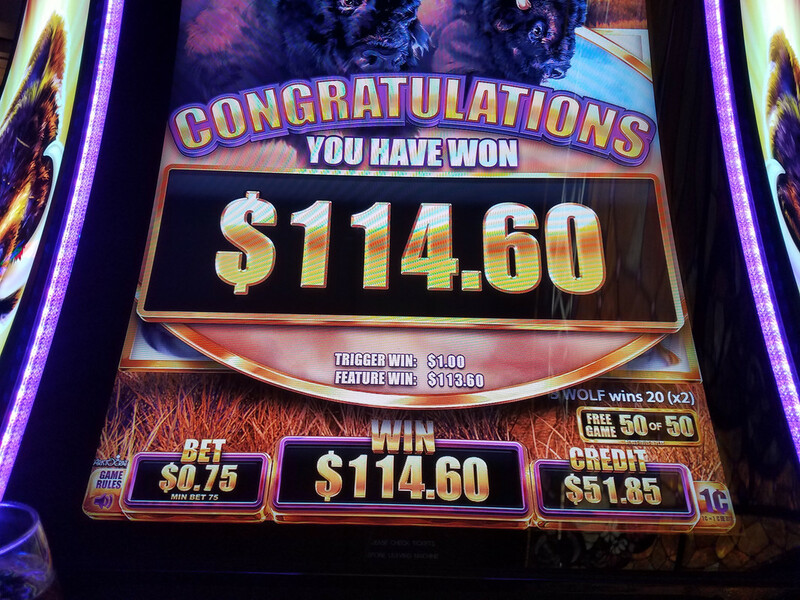 Sunday gambling was also uneventful. Sunday night I just wanted to eat dinner in my room so I headed down to get something and bring it back to the room. 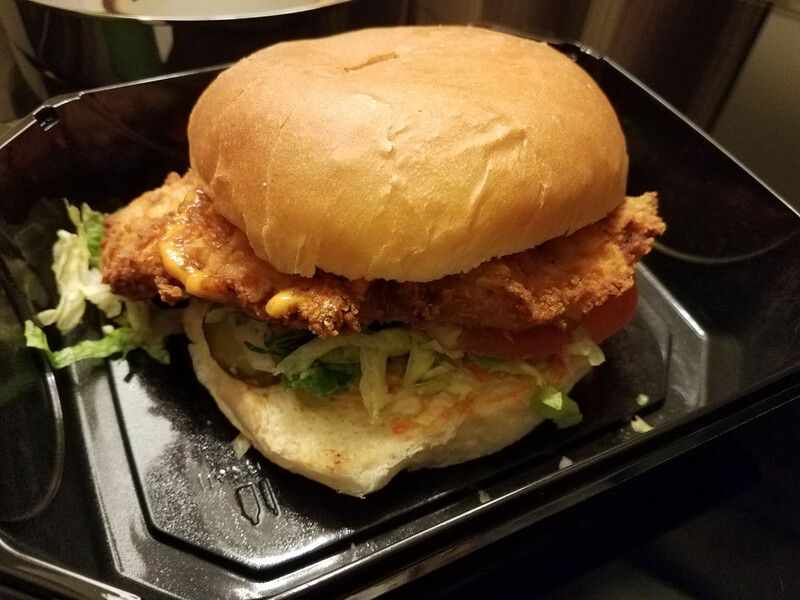 I wandered over to the new food court at Circus Circus and got this really good fried chicken burger at The Habit Burger Grill. And next door to that was Yogurt Beach. 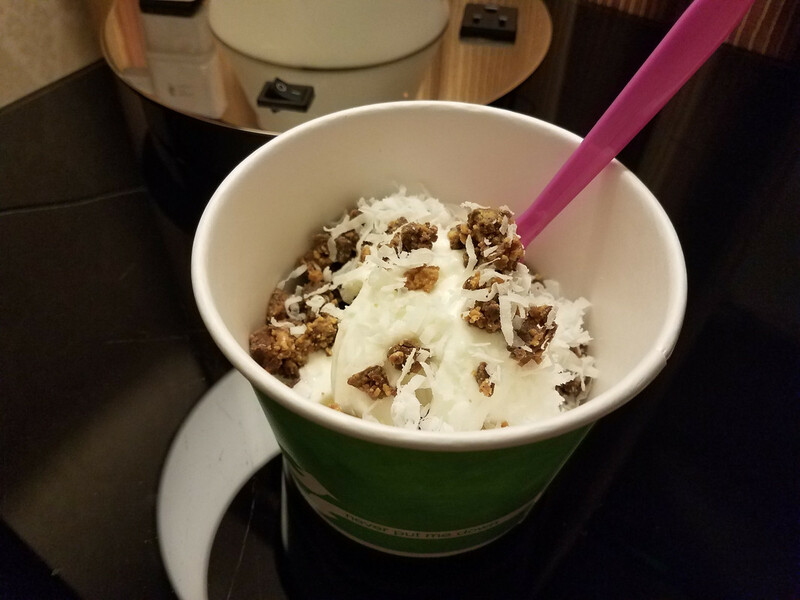 A great little place with a huge amount of flavors of yogurt and more toppings than you can imagine to put on your yogurt! Hawaiian Coconut sounded good to me. On Monday it was time to head down and see an old friend, the Cal Neva. I just love this place! It’s like a step back in time here. 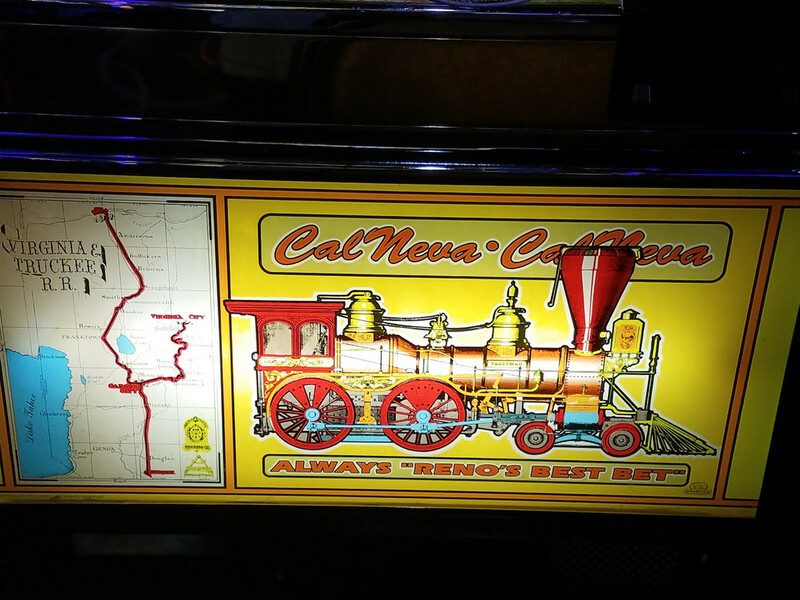 They have a lot of the newer slot machines at Cal Neva like most other casinos but it is really great that some of the oldies are still around. Truly the classics. 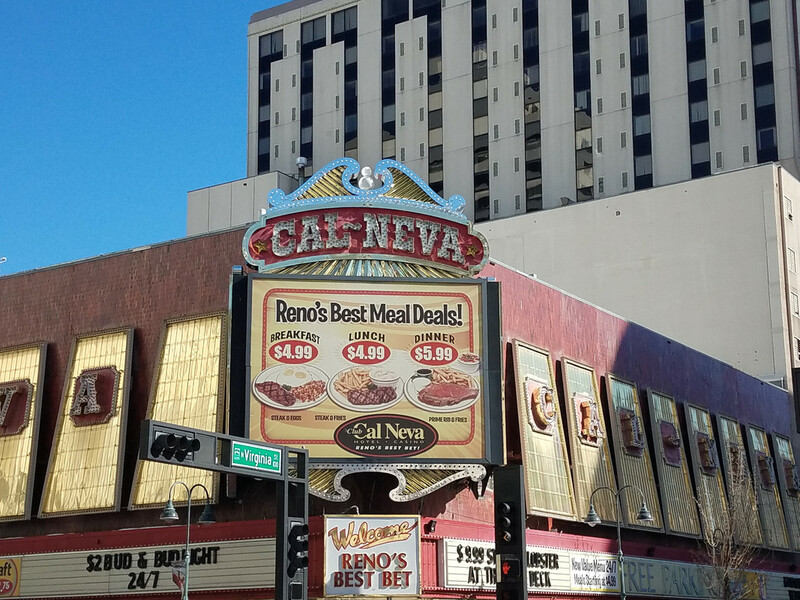 I had lunch at the Cal Neva. 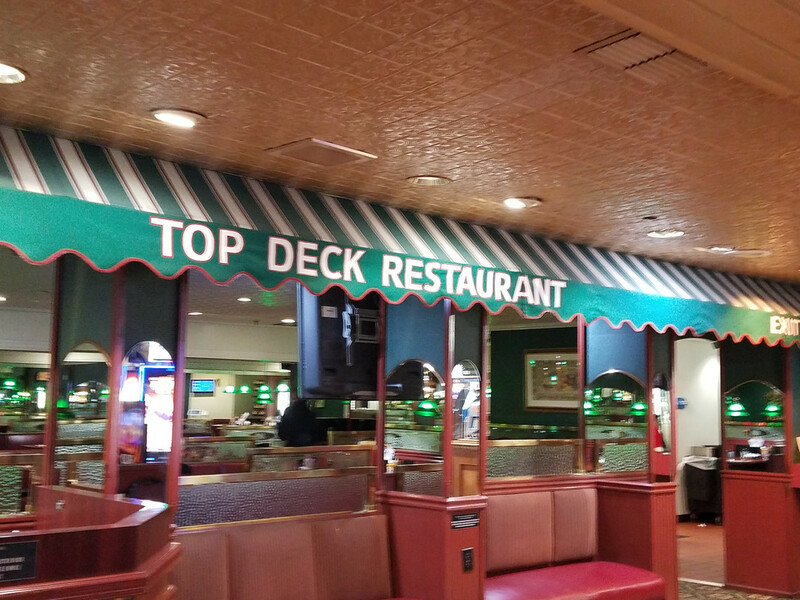 I had the most awesome artery clogging sandwich at the Top Deck! 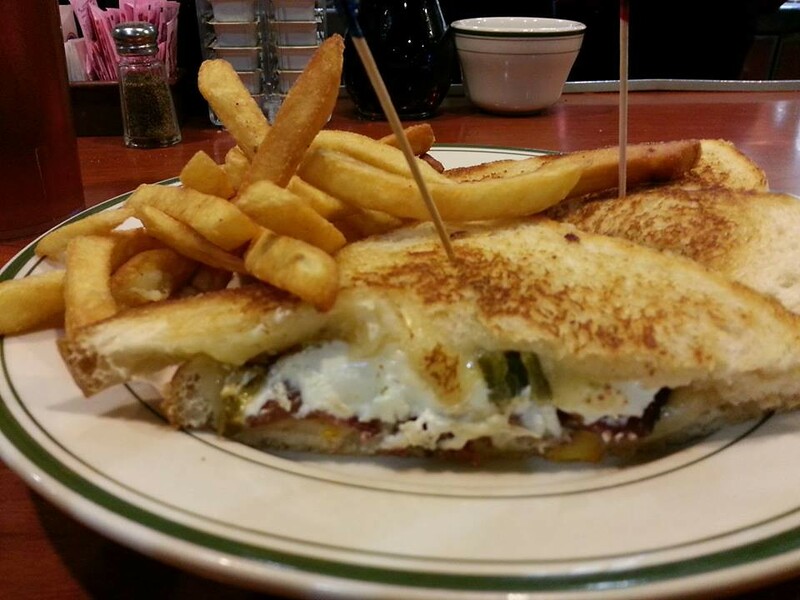 Three of my favorite things all rolled into one sandwich: Bacon, cream cheese and jalapeno peppers! Um yes, it was deeeelish! 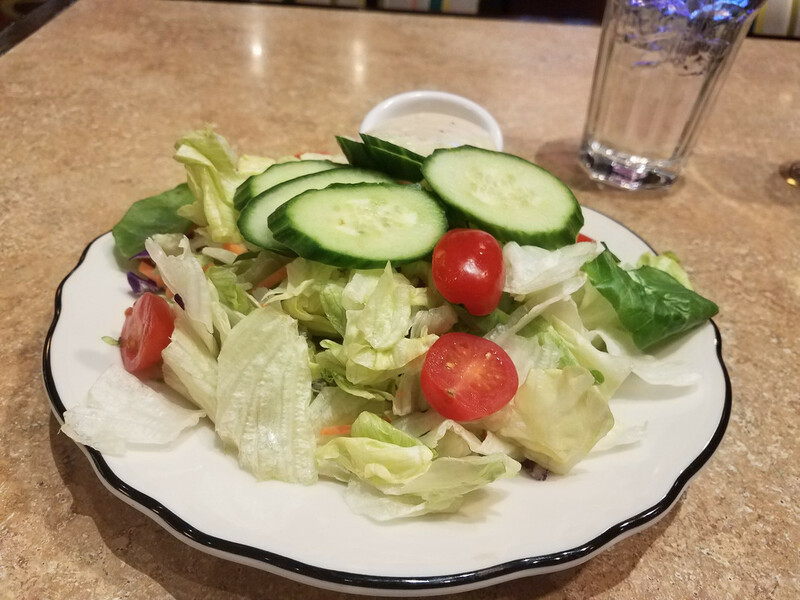 And where else can you get all this for only $5.99? 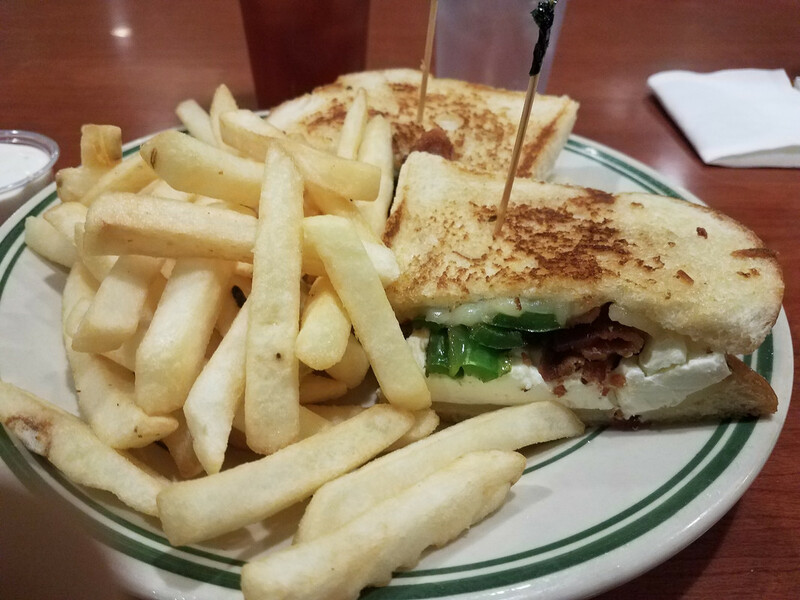 After the Best Sandwich Ever, I headed back to SL. 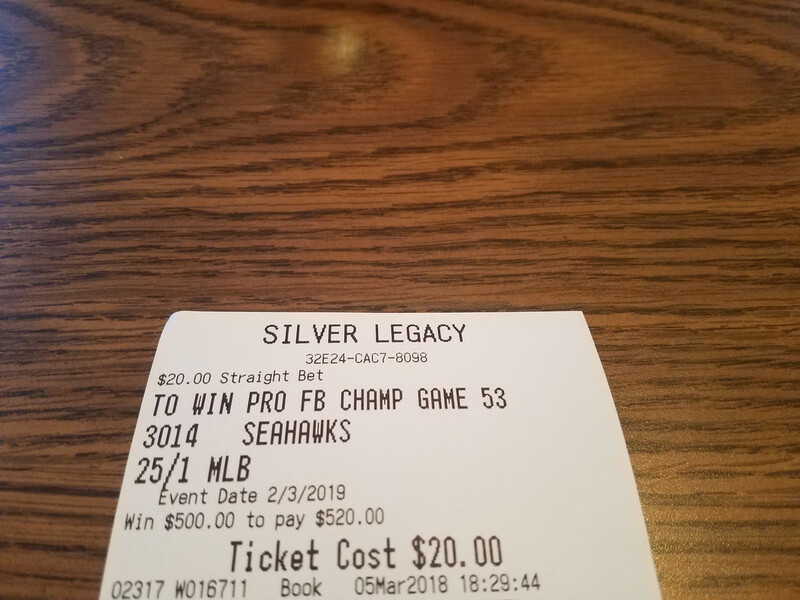 I stopped in the sports book that evening to place my annual tradition bet of the Seahawks winning the Super Bowl. 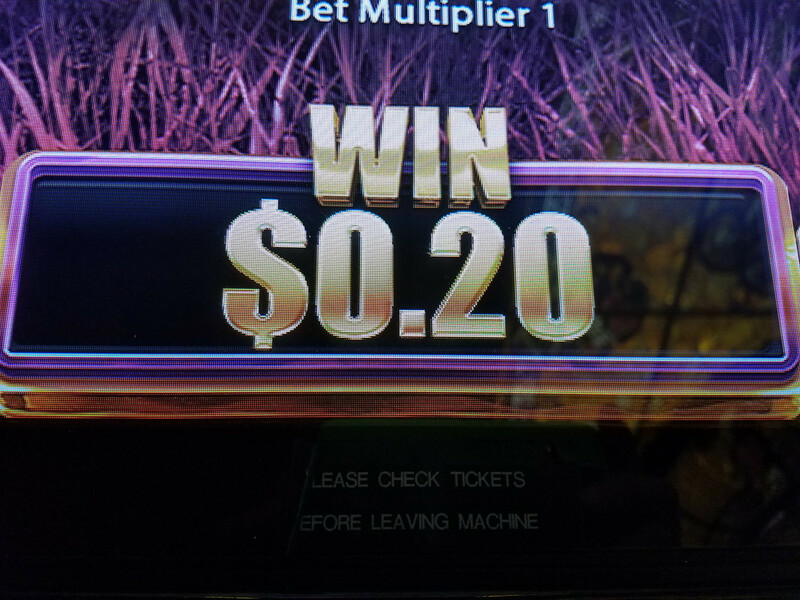 I made a whopping $20 bet with 25-1 odds. 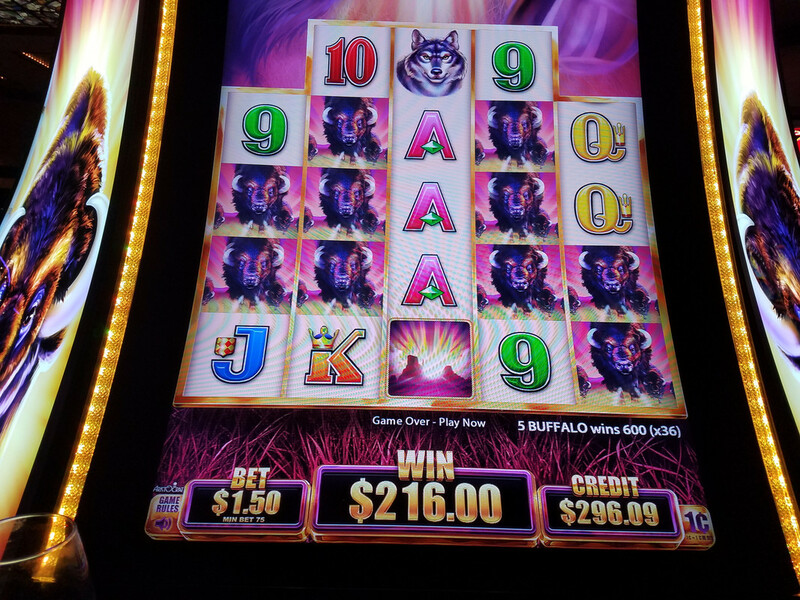 I wouldn’t mind a $500 payout on a $20 bet. Then I headed back upstairs to my room to enjoy the sunset with, yes, another glass of Fume Blanc! Well, it’s already Monday night, my last night in Reno. 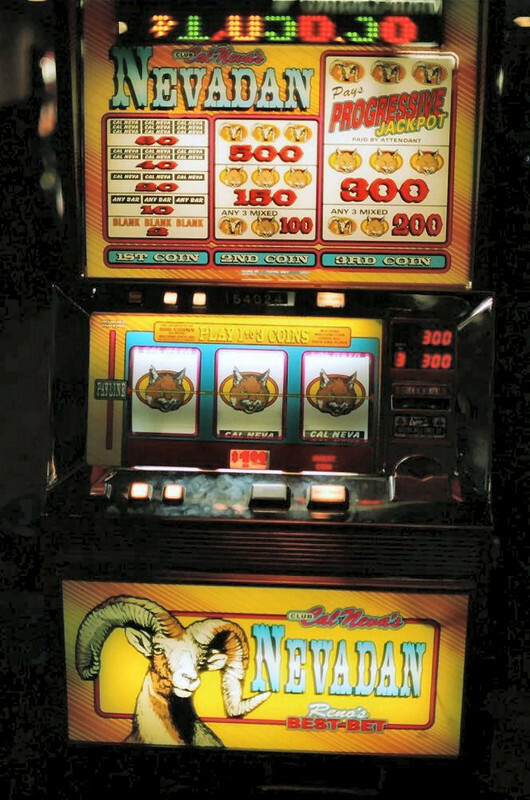 Time to head down to the casino for my last hurrah. 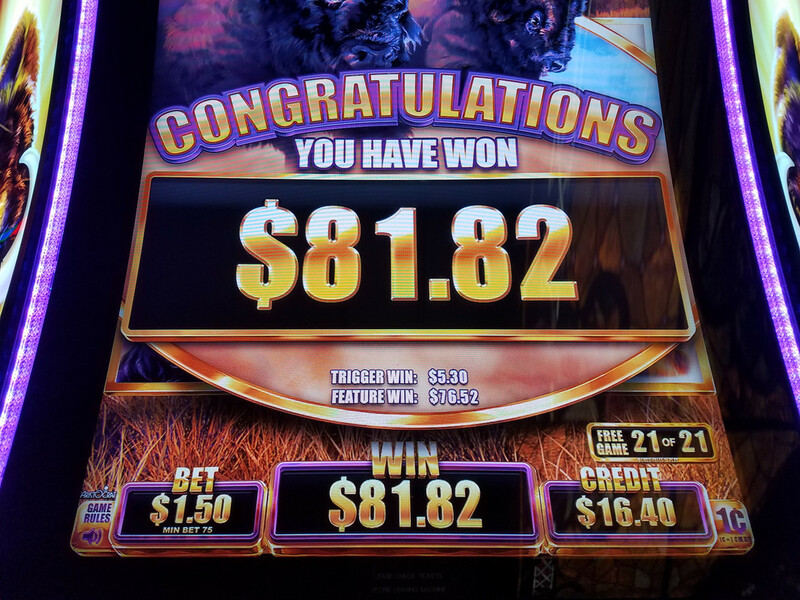 To make up for the terrible luck I had at the start of the trip, the slots decided to loosen up some on my last night. My last night’s dinner at Café Central at SL. Damn! Is it Tuesday morning already? Why do the Reno trips always go by so fast? 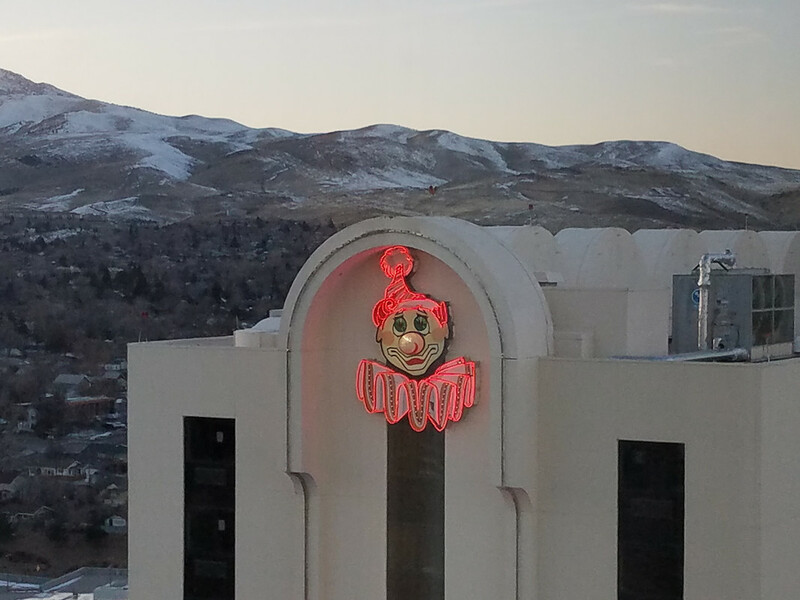 Now it was unfortunately time to say goodbye to Reno and fly back to Seattle. I was on the 8:30 a.m. shuttle to the airport for my 10:30 flight back to Seattle. 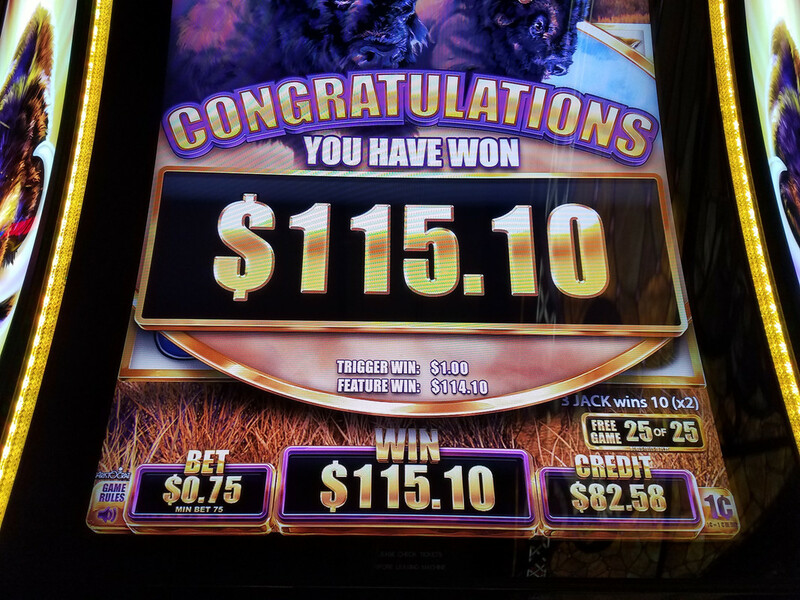 Since those darn Buffalo Grand slot machines refused to pay me the $1.1 million top jackpot I couldn’t retire early and am now back to the daily grind and, unfortunately, working for a living. 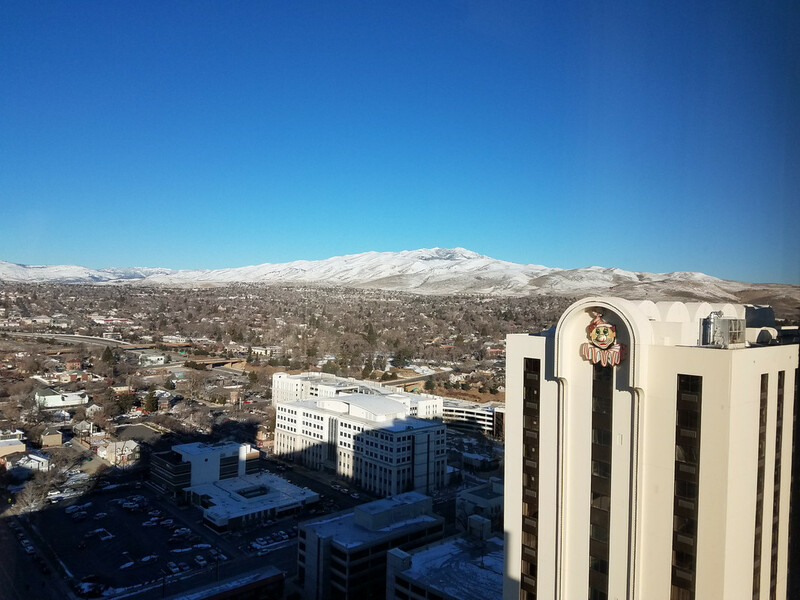 Another great trip to Reno, as always! I’ve probably been going for about 25 years now. 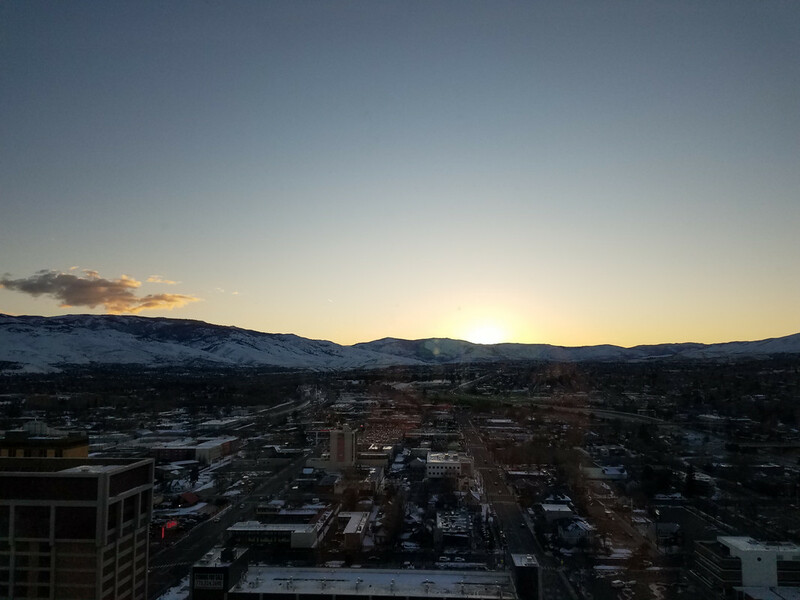 I really don’t think there is such a thing as a bad time in Reno. I hope I can swing another trip to Reno in the fall this year, maybe October. 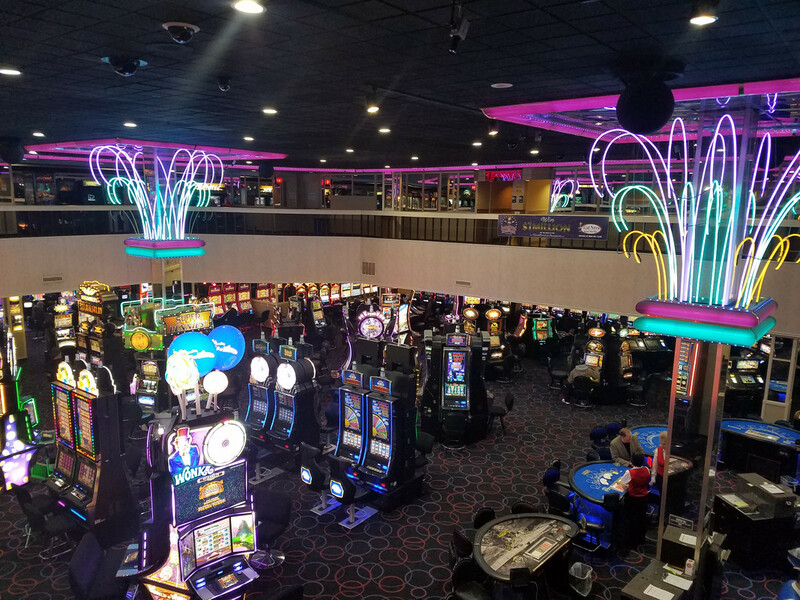 Such fun down there watching the games in the SL sports book during football season. Posted: Mar Fri 09, 2018 10:40 pm Post subject: An awesome, classic and fantastic trip report!!! Thoroughly enjoyed your trip report. Beyond thoroughly! 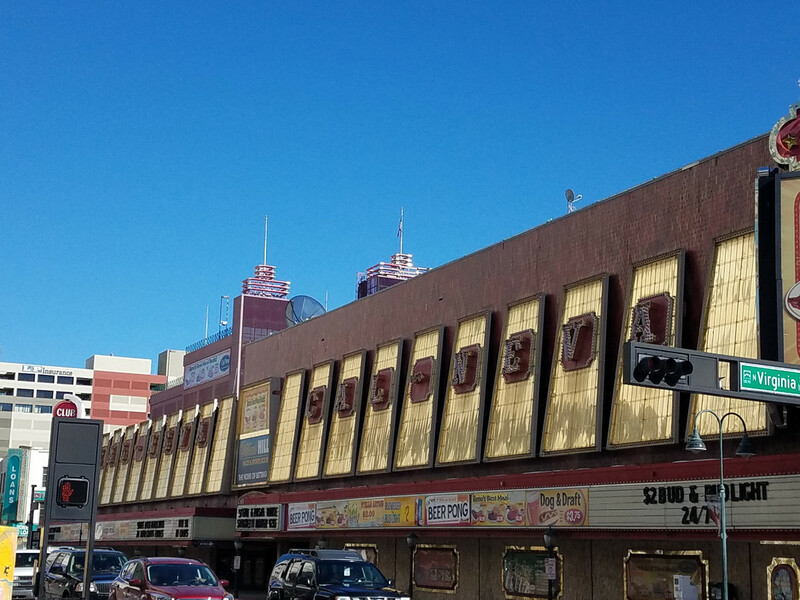 Fantastic pictures that made me really miss Reno. Love the corner room and the Carano wine at sunset - beautiful! 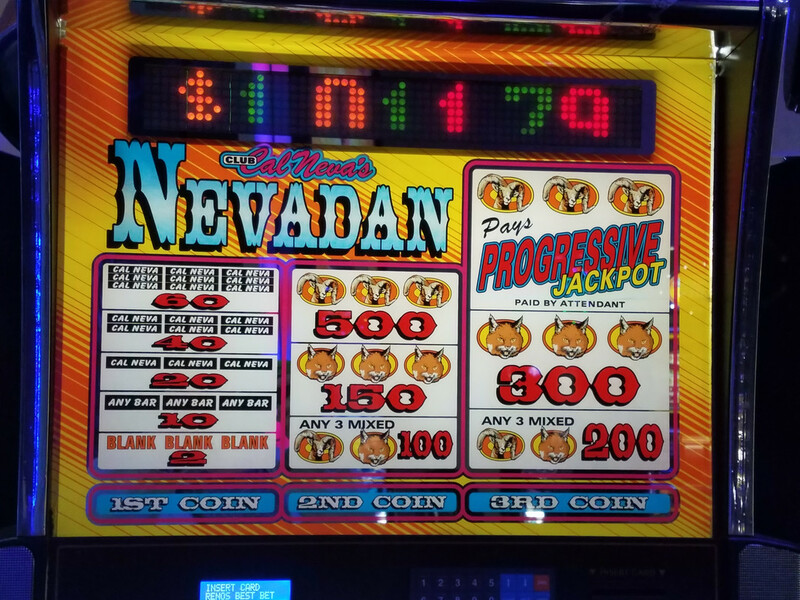 Too bad Reno's Lady Luck did not smile upon you the first couple of days but at least she awoke and blessed you on that last day. Love the Cal Neva pics - Man I used to spend an awful lot of time there. Still would if I could get there a little easier. your Pic. of the Arch reminded me they have been restoring it for several weeks. Looking good, I watched them several times from the webcam on the city hall roof, if you look close you can see it sticking out on the north west corner of the roof. Great Trip report. Thanks for a very interesting and entertaining TR. Pictures worth 1000 words. 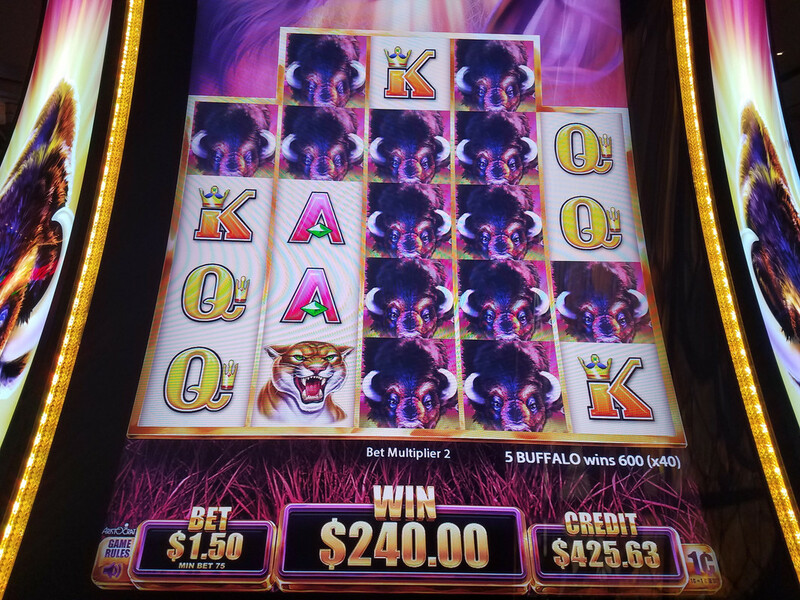 Wow...you really beat them buffalos like stepchildren. They always stampede right over me. Great wins and a great report. Hurry back to Reno! I LOVE this kind of TR. Details, wins, and photos, photos, photos. Ok you know I'm a bit of a airplane nut perhaps: You flew back on the prop Dash 8, but what did you fly on the way there? That winglet looked like a 737. I haven't seen any 737s on the SEA-RNO route in a while. 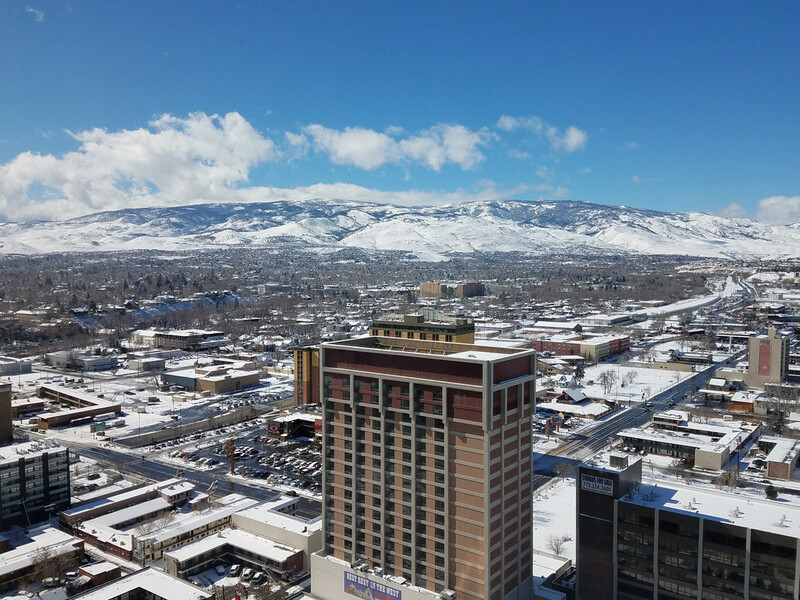 We went in Feb on a 50 seat CRJ700 and bumped around the sky out of Reno like a washing machine. But let's get to food: Canter's and Habit? Both places I wanted to try, but unable to (closed or too long a line). Thx for the pictures. I always hunt down the old reels in the Cal Neva too! Speaking of the Cal, I found the smoke to be WAY less than in recent trips. Thoughts? Hey there, Zydeco. The plane I flew down on was an Embraer 175. Here is a link for ya! It holds the same amount of people as the Q400’s but I liked this plane a lot more than the Q400. The windows were very large (and according to this link are the largest windows in Alaska’s fleet). The overhead cabin space was better than the Q400, more than one bathroom, and the bathrooms were pretty large, even had room for a sink (those Q400 bathrooms are so small there is no sink, only hand sanitizer). The engines were quieter. And seemed like more leg room too. So in a nutshell, everything about the E175 was better than the Q400! 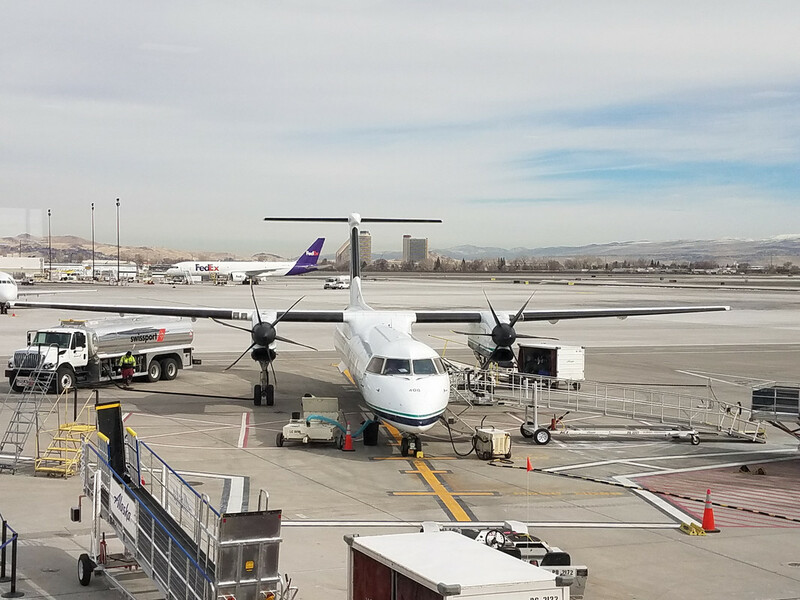 I hope to fly on one of those to Reno again someday. It was a SkyWest flight (not Horizon Air) operated by Alaska. I think 737’s between Seattle and Reno are unfortunately a thing of the past. 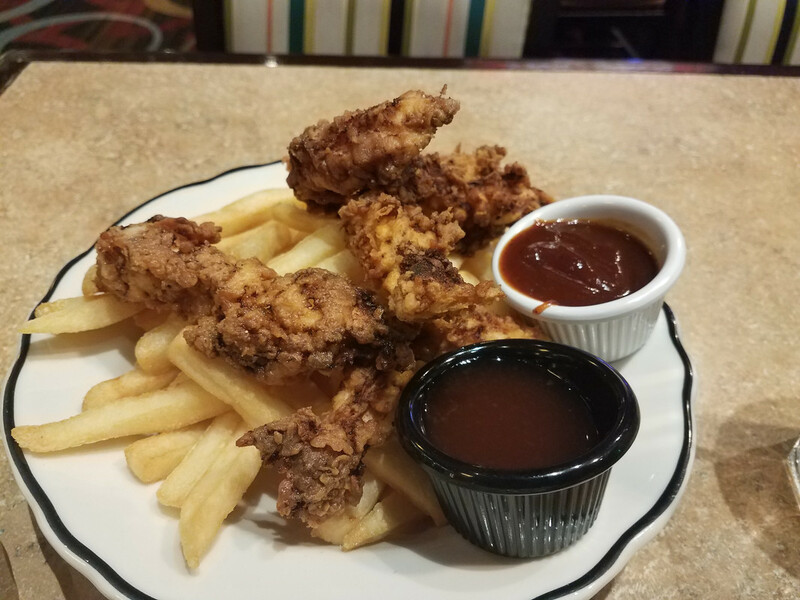 Canter’s Deli at SL is really great food. A large variety menu too. Habit Burger Grill at CC was good too. I’m not much of a beef person (why I got a chicken burger instead of beef) but it was an okay place. And the burgers are cooked over an open flame so there’s that. 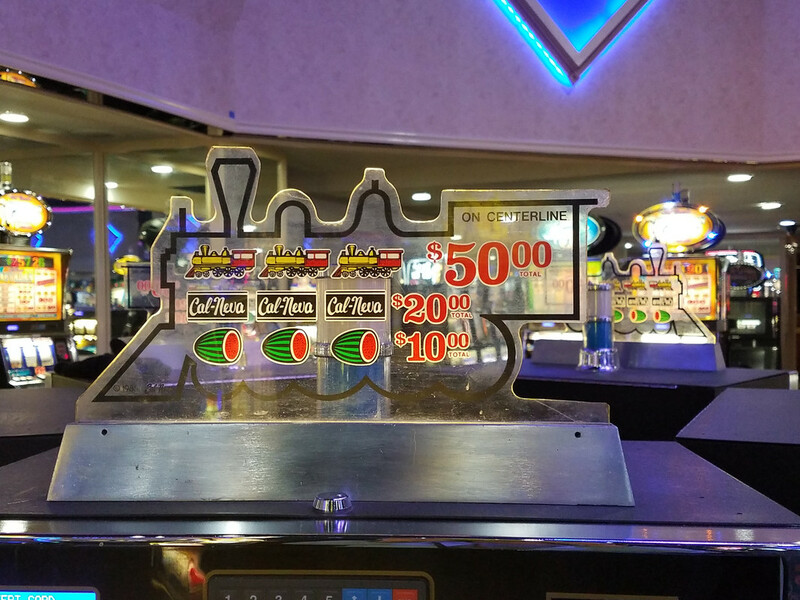 I gotta say CC has really upgraded to a nicer food court. In addition to Habit and Yogurt Beach I posted in my review there was also a Panda Express and Piezzetta Kitchen. I thought I would try that pizza place since Hidden Pizza at Eldo was closed on Sunday night but they don’t serve by the slice there. Bummer. I think there were other places in the food court too. I will check it out more closely on my next trip. Yeah, I don’t remember smoke being an issue at Cal Neva. Such a great old place! I discovered that bit of heaven four years ago.